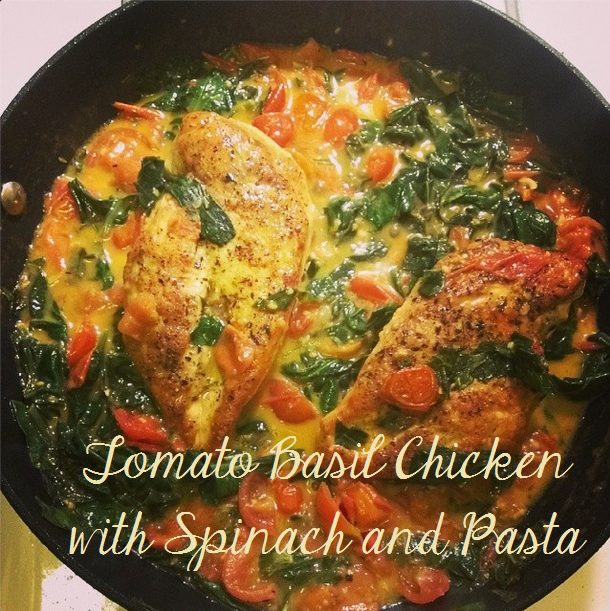 In the past few months we’ve been trying to cook more interesting and tasty dinners and this recipe did NOT disappoint! Makes about 4 servings. We doubled the recipe and cooked it in two batches so we had leftovers for the week, and this makes awesome leftovers! Italian seasoning, or dried basil. Whatever floats your boat! Put on a pot of water (for the pasta) to boil while you cook the chicken. You’ll need to keep an eye on this pot throughout cooking the chicken so you notice when it’s boiling. When the water does boil, cook the pasta according to the box’s instructions. Add 2 tablespoons of olive oil to a skillet and let it get hot. When the oil is hot and your pan is heated, add in the chicken breasts. There should be a lot of sizzling right away; that’s how you know you did it right! After the second side of the chicken has been cooking for about 4 minutes, add in the tomatoes. Again, there will be a lot of sizzling! Next, add in the basil, followed by the butter. Add in the garlic, then spinach, and stir everything together. Once your chicken is cooked (for our thick chicken breasts it took about 10-12 minutes total to get to 160°F inside), reduce the heat to the lowest setting until your pasta is done cooking (if it isn’t already). Turn off the heat on the skillet and take the chicken to a cutting board, let it rest for a few minutes, and cut it into whatever size/shape you want. We cubed it. Once you cut the chicken, add it back to the skillet with the sauce. Add some pasta to a bowl, top with the sauce, and add some Parmesan cheese on top.